Integra: There’s been some discussion lately of whether we, the characters, know that we’re in a comic. In other words, do we break the fourth wall? The answer is — sometimes. Only when it’s funny. It never lasts. This idea of limited fourth wall breakage is not new. In this Gasoline Alley from November 25, 1921, Walt commends his son for doing something funny in the final panel, as a comic strip character should. But usually these characters act as if they’re in the real world. It’s better that way. After all, if I knew we weren’t real, why would I bother with the Hellsing Organization? So far, the only casualties are nameless extras with no backstory. 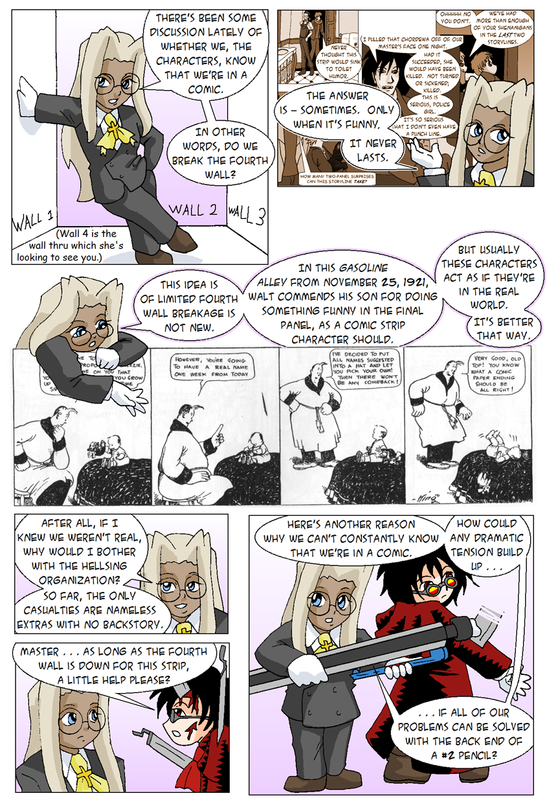 Alucard: Master…as long as the fourth wall is down for this strip, a little help please? Integra: Here’s another reason why we can’t constantly know that we’re in a comic. How could any dramatic tension build up…if all of our problems can be solved with the back end of a #2 pencil? REMEMBER, KIDS: ALL FOURTH-WALL PROBLEMS CAN BE SOLVED BY EITHER HAVING HELLSING GUARD IT OR BY COMPLETELY BURNING IT TO THE GROUND. The first leads to war, the second leads to undescribable things happening. Such as a blank area. 4th wall breaking is good stuff when done sparingly. I’d imagine Alucard would be the most aware of their comic strip status, given his otherworldly perception abilities. BTW: erin how is (or was) it in england? SIDE NOTE: did you know that the caliber .454 Casull is real? Yes, real caliber, however no production firearms manufacturers curently produce it in semi-automatic. Not that the caliber doesn’t change from time to time. Sometimes it’s a 13mm .454 and sometimes I believe it’s a 12. 🙄 Anime tends to be much less picky about reality, prefering to go for the “that’s a whopper of a pistol” effect. A frustrating fact for cosplayers trying to make accurate replicas. i guess i could better not tell you that a cosplayer that i know is a member of the family that owns Hecker & Koch and he is asking daddy to get a working replica in the same caliber?